Thousands have been committed to the asylum over the years, and hundreds unfortunately died here. Decide for yourself if they're still occupying the historic wards and treatment rooms in this 2 hour tour of the supernatural hot spots. These tours last approximately two hours (10:30 p.m. to 12:30 a.m.). This is a guided tour of the 4 hottest spots in this 242,000 sq. foot Asylum. You will be broken into groups of approximately 10 and assigned a guide. Bring your camera, digital recorder, EMF meter, etc... Make sure you stay with your guide. You never know what could happen if you break from the group. You can not record the actual tour. Cost is $40 per person. 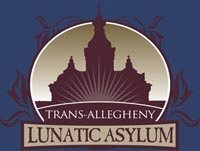 Your tickets will be given to you at the Asylum.